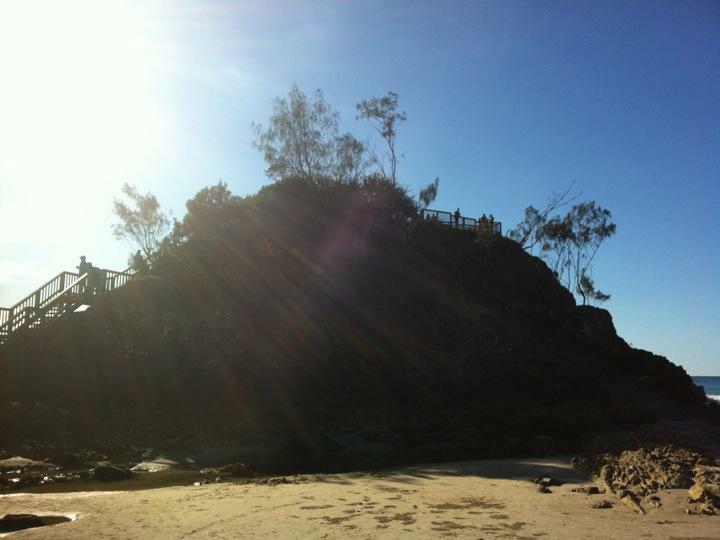 Byron Bay is probably the most wonderful place I've ever been to so far in all my travels. I arrived early in the morning on the greyhounds which in one way was a curse, since nothing was opened and too early to check in to any hostel. But on the other hand, this also meant that I was (almost) able to see sunrise in one of the most gorgeous locations ever, slowly rising over the brightly colored blue field called the ocean. It was amazing, felt a bit like our summer chalet in Skåne, but with the notable exception that here there was a tiny, cozy little village right up until the beach, and even though it is practically winter here, the water was still 23-24 degrees and crystal clear. The area is a wildlife habitat, so all the local fauna is completely fearless. When I first waded out into the water, i noticed there was a fish swimming nearby... After a few minutes there was another one. The further along the day drifted, the more fishes I started noticing. At around 2 PM there was dozens of fishes paddling around, literally within reacing distance. If I would have had a net, I wouldn't have to pay for dinner. Probably not for acomodation either, since, as I mentioned, it's illegal to damage the wildlife in any way. But it was kinda creepy that I seemed to be the only one encircled by fifteen (quite large) fishes, closing in anytime I stood still for a moment. Saw tons of surfers aswell out by the beach, not suprising though considering Byron is usually known for two things: surfers and hippies. There's plenty of both here. I've never seen as many yoga studios, new age healing centers, vegan products etc etc. Literally never seen this many, not just in proportion to the limited size of the place, but more than I've ever seen in any city. In dawn, the beach was filled with elderly people doing sun greetings. The bad part about everything was that it was so nice and warm on the beach that not only did I burn my shoulders, but also my forhead and neck. Small price to pay. And I still havent mentioned the reason I actually stopped by here: Parkway Drive! The home of one of the worlds greatest band. That's the only reason I took a night here, although there is plenty of reason to stay here I've discovered.